The messy middle is big enough to hold creative chaos. I teach English to junior middle school students Friday mornings. 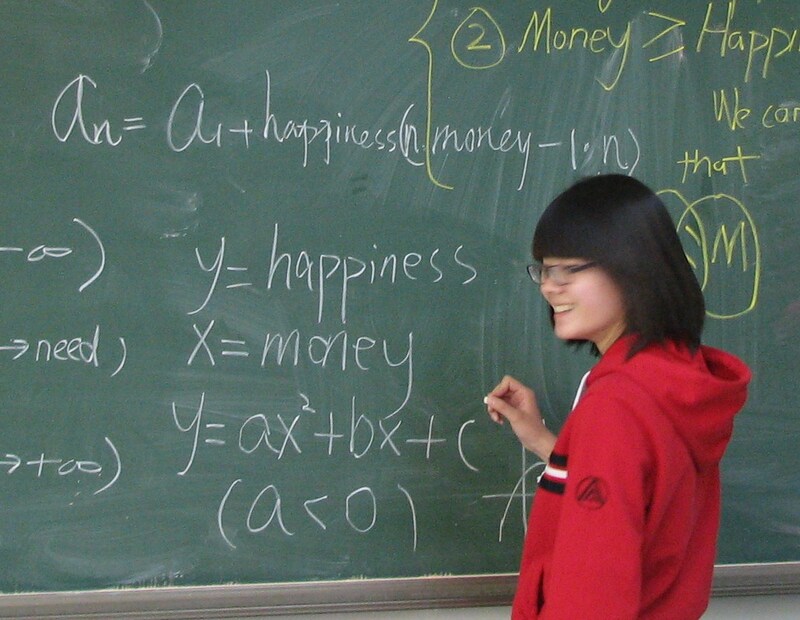 Middle school in China encompasses junior middle school (grades 7-9 in the US) and senior middle school (grades 10-12). Two weeks ago my schedule was changed, adding a 10th grade class to my dear, bouncy 7th and 8th graders. There was a slight miscommunication and I was given Book Four in their textbook series when they won’t be done with Book Three until the end of April. The first unit in Book Four is on money and since it’s the only book I’ve got, we are doing one l-o-n-g unit on money. 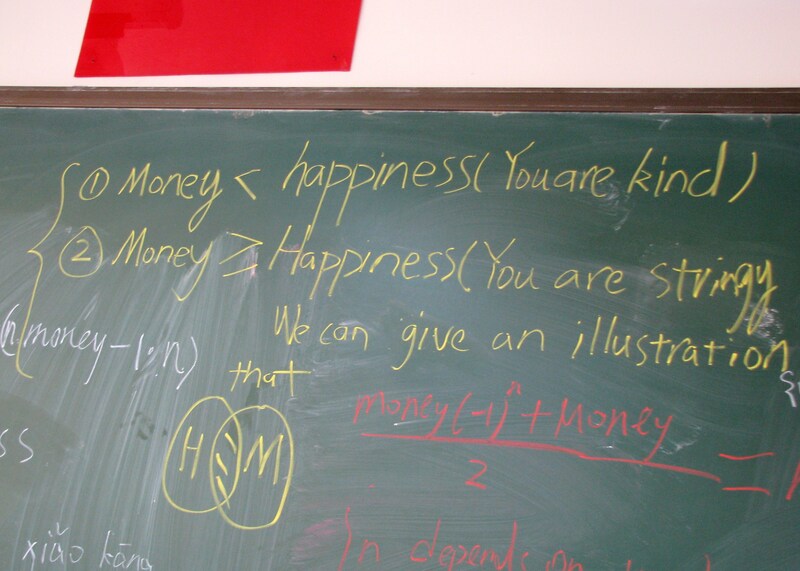 Last Friday, the second time I taught them, I was greeted with “teach us math!” Not going to happen (even though I’d taught math in the US); but then I had one of those inspiring moments we all long to have, where things just come together. 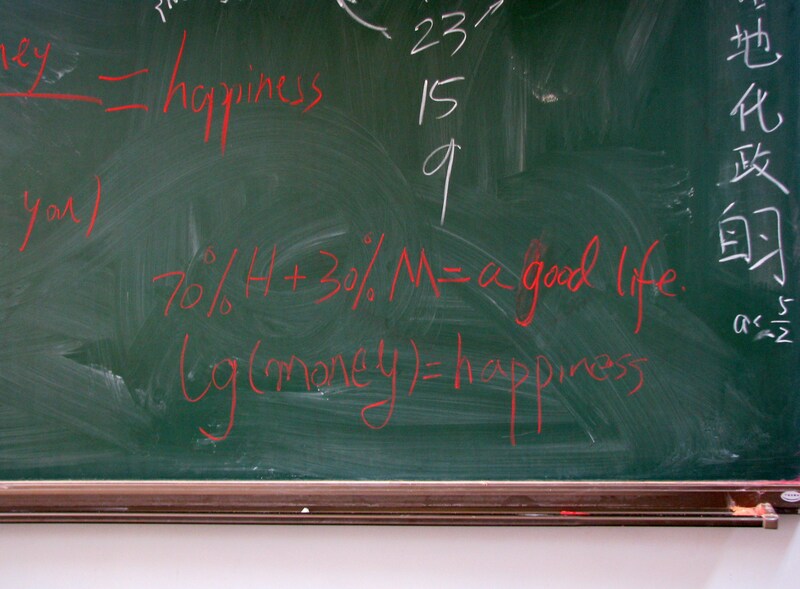 On a whim I wrote “happiness” and “money” on the board and asked them to make a mathematical equation showing the relationship between them. I made a pathetic sample I’m not going to show you because, well, I look like a simpleton. As I walked around the room there was a buzz in the air. “Miss Amy, can we use functions?” Can you?! I randomly chose four students to write their equations on the board, but others wanted to as well. I love that it culminates in a venn diagram! Even I can grasp that one. 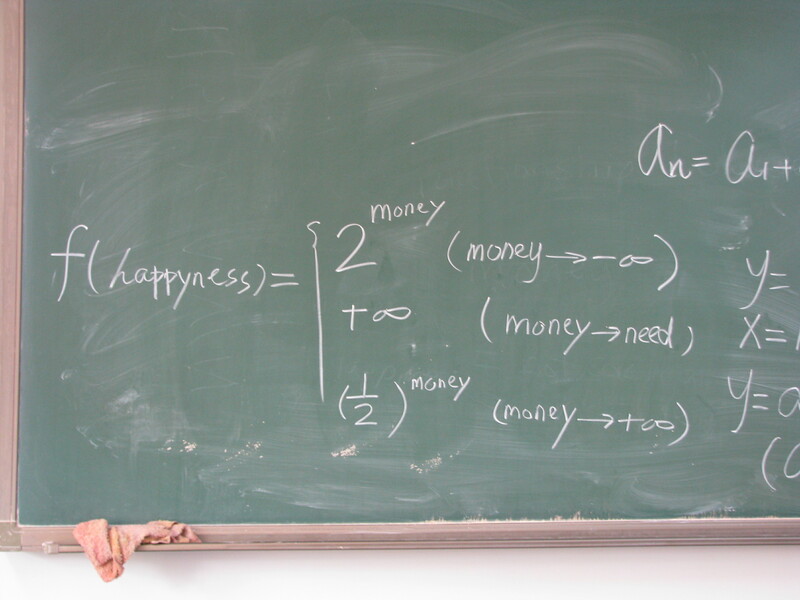 There were graphs, exponents, sets, functions, greater than, less than, infinity, and diagrams as they depicted deep and signficant things in relating money and happiness. In that class, I learned more than they did. 1. My definition of “Chinese Creativity” is far too narrow. Over the years I’ve been asking them to be creative in ways I know how to be creative without linking it more often into some of their strengths. 2. I’ve been asking the wrong question. Instead of asking what my students don’t know and filling in gaps, I also need to ask what they already know and incorporate it more. Learning’s never done in the messy middle, is it? Love that. Where might you need to broaden your thinking? Where might you need to ask different questions? Any responses to the equations? I’d love to hear! Your students are so lucky to have you as their teacher. I love the directions you allow them to take you and in that way you know where to go for the next lesson. I can see why they enjoy you as their teacher. If my brain worked more logically, this would all make more sense. Love your blog (I may have mentioned that before but it bears repeating). Wow, that first one with the function and infinity brought back a lot of math memories. It’s cool that you could have a new appreciation for your students after giving them an open-ended problem and seeing them succeed. Wow! If that’s what students are doing in China, no wonder we are in trouble! That is awesome-sauce. How do we get American kids to think out of the box like this? I know … it really kind of shocked me how quickly they came up with them! It was a good “chain rattling” for me!